I thought an appropriate subject to follow on from a very recent post on posture, and ensuring the body and arms are positioned well for playing, would be a post on your dexterous digits. As I stated in a very recent post, the foundation of your movements in playing the guitar should really come from the bigger muscle groups. Once you’ve identified the leverage-type shoulder movements in the left arm (or right arm, if you’re left-handed) and you’ve got a grasp on, well, grasping the guitar comfortably with the right hand, then we can move on to looking at the movements of the hands, fingers and thumbs. Make a loose fist with your right hand as if you were going to punch something, curling your fingers under. Unleash your fingers in a relatively rapid reflex-kind of action. Be aware of the finger movements here – the fingers should be moving from the big hand knuckle. 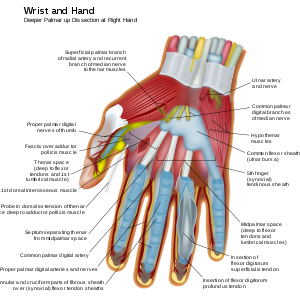 This knuckle is the primary driving force behind both your free stroke and rest stroke. Of course, there will be some movement of the other two knuckles in the fingers, but the primary “stroke engine” should be your big ol’ hand knuckles. 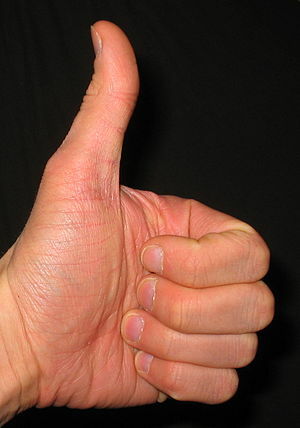 Similarly with the right hand thumb. Unless you have some issues that prevent it, all of the right hand thumb movement should originate from the base of the hand. Check out that relatively long bone you’ve got there coming from the wrist and that big ball of muscle forming the base of the thumb – that’s what you really want to use to drive a bit fat juicy bass! And the other hand. Don’t want it to feel “left” out…. Sorry. Bad pun. Love them. You should aim to keep your lower left arm, wrist and hand in alignment. Obviously this is not going to be possible all of them time, but this is a key aim to prevent things getting all squished and smooshed together and rubbing and constricted and all things nasty going on in that very small conduit for all manner of tendons, muscles, nerves, veins, arteries and who knows what else that is the carpal tunnel. My most important piece of advice here is to avoid unnecessary tension in the left hand. You need much less pressure than you probably realise to fret a note. A wee experiment: try just touching the string with a super, super light touch with the left hand, just grazing it and try playing the note. It will sound not like a nice note, but buzzy or thunking probably. Gradually, ever so gradually, whilst playing the string with the right hand apply a little more pressure until the note starts to sound. I’ll bet you $50 that there’s really hardly any pressure at all there and you’re still pressing quite lightly. Occasionally, we might need an extra bit of pressure,for an awkward stretch or squeezy barre for example. In this instance, use that leverage principal and take the pressure and tension our of your fingers, out of your hand, even out of your arm and shoulder, and lean in with the body. Lean your body in to the guitar to meet the required finger pressure – the greater the pressure required the greater the lean. Have a think about these things next time you’re practicing – am I squeezing too hard? Do I need that amount of tension and pressure? Is that pressure and tension really helping? !